“Dwarka”, the word itself makes anyone gets reminded of Krishna and the mesmerizing kingdom city that Lord Krishna ruled as a great King. Being one of the places for the sacred Char Dham Yatra located in the western India in the state of Gujarat, Dwarka is an important pilgrimage site established by Sri Adi Sankaracharya as one of the Char Dham Kshetra’s. Traditionally, an opulent city would have many gates, indicating the king’s confidence in protecting the city. The original city of Dwarka, described in the Srimad-Bhagavatam, the Mahabharata, and other Vedic scriptures, was a fort city built within the sea. Lord Krishna built Dwarka to protect His kinsmen, the Yadu dynasty, from repeated attacks by kings and armies intent on killing Him. By the will of the Lord, Dwarka disappeared into the sea at the time of the Lord’s departure from this world. Archaeological excavations have brought out from the sea many artifacts suggesting that an opulent city stood there in the distant past. Gomati River connecting the Arabian Sea. Famous also for having one of the 12 Jyotirlingas, Dwarka is best known as the home of Lord Krishna and will enchant you with the holiness that the air here carries. Dwar, meaning door in Sanskrit, is believed to be the gateway to heaven. Legend has it that the city was once engulfed by the sea and recent excavations reveal that a city did exist here. People from all parts of the country come here to seek blessings from the temples of Dwarka. Dwarkadhish temple, dedicated to Lord Krishna is an architectural marvel and the most famous temple of the town. Apart from this, Nageshwar Jyotirlinga temple, Rukmani temple, Gomti Ghat and Somnath temple are the other sacred spots of Dwarka. Gomati River during its Sunset. Just an FYI, my Blog, Page “Sacred Soul Diaries” has the same picture of the above. Dwarka is believed to have been the first capital of Gujarat. Located in the Saurashtra peninsula of Gujarat, Dwarka is part of the Char Dham pilgrimage and is also one of the seven ancient cities (Sapta Puris). The Seven Sacred Cities of Ayodhya, Mathura, Haridwar, Banaras, Kanchi, Ujjain and Dwarka are known as Mokshada, meaning ‘Bestower of Liberation’, and these sites are believed to confer liberation upon all persons who die within their boundaries. Dwarka, one of these seven sacred cities, is also listed among the Four Divine Abodes. Legend has it that Krishna came here from Mathura here after killing his uncle Kansa. The main temple at Dwarka, situated on the banks of Gomti River is known as Jagat Mandir (universal shrine) or Trilok sundar (the most beautiful in all the three worlds). History says that this majestic temple has been built by Vajranabh, the great grandson of Lord Krishna, more than 2500 years ago having a glorious structure seeming to rise from the waters of the Arabian Sea. Its exquisitely carved shikhar/gopuram (Temple Tower), reaching 43 m high and the huge flag made from 52 yards of cloth, can be seen from as far away as 10 km. The 8th Jyotirlinga of Lord Shiva Nageshwar Temple in the city of Dwarka. The grandeur of the temple is enhanced by the flight of 56 steps leading to the rear side of the edifice on the side of the river Gomati. The temple is built of soft limestone and consists of a sanctum, vestibule and a rectangular hall with porches on three sides. There are two gateways: swarga dwar (gate to the heavens), where pilgrims enter, and moksha dwar (gate to liberation), where pilgrims exit. The Island of Beyt Dwarka which is 20Kms from the actual Dwarka City. Archaeological Survey of India has revealed the existence of a old city dating back to two centuries. The excavation work carried between 1983 and 1990 revealed that a township was built in six sectors. A fortified wall, extending more than half a mile has also been unearthed. The present day Dwarka is a prominent pilgrimage site and boasts of several shrines. Conch Shells, Dwarka Silas, Garlands made out of Seashells attracts the road towards Beyt Dwarka. Among the temples, the 2000-year-old Dwarkadheesh temple is the most notable one. Besides its temples, the city is also popular for its beaches. Scuba diving to see the underwater remains of Dwarka is a popular activity here. Dwarka as the most superb and beautiful city in the history of the world. The island of Dwarka is decorated with 900,000 extraordinary mansions built of first-class marble, with gates and doors made of silver and jewels. The clear blue-green ocean lies on all sides. The residents of the mansions, all pure devotees of Krishna, are of very fine beauty. Some of the ancient excavations found under the current city of Dwarka in the Arabian Sea. The Age of Kali thus ushered in turns out to be none other than the present epoch of the earth – our own. According to the Hindu sages it began just over 5000 years ago at a date in the Indian calendar corresponding to 3102 BC. The Deity of Sri Sri Dwarkadesh which is opposite to the main Temple entrance ( Swarg Dwar). Sri Sri Radha Gopinath in a Gopinath Talab, a temple on the way to Beyt Dwarka. Dwaraka’s innumerable gardens and parks are full of a variety of sweet, colorful flowers, and orchards abound with an array of fruit. Beautiful chirping birds, intoxicated peacocks, and ponds filled with lilies and lotuses delight the senses. The residents decorate every lane and walkway with water pots, festoons, banana trees, and fragrant flowers, just in anticipation of Krishna’s strolling there. An 1800’s painting of the sacred town and temples of Dwarka. The seven-story high temple is built on 72 pillars. From the temple dome waves an 84 foot-long multi-colored flag decorated with the symbols of the sun and moon. “The City was filled with the sounds of birds and bees flying about the parks and pleasure gardens, while its lakes, crowded with blooming indivara, ambhoja, kahlara, kumuda, and utpala lotuses, resounded with the calls of swans and cranes. Dwarka boasted 900,000 royal palaces, all constructed with crystal and silver and splendorously decorated with huge emeralds. Inside these palaces, the furnishings were bedecked with gold and jewels. Traffic moved along a well laid-out system of boulevards, roads, intersections, and marketplaces, and many assembly houses and temples of demigods graced the charming city. Dwaradeesh Temple during the dusk. The roads, courtyards, commercial streets, and residential patios were all sprinkled with water and shaded from the sun’s heat by banners waving from flagpoles. In the city of Dwarka was a beautiful private quarter worshiped by the planetary rulers. This district, where the demigod Visvakarma had shown all his divine skill, was the residential area of Lord Hari [Krishna], and thus it was gorgeously decorated by the sixteen thousand palaces of Lord Krishna’s queens. Narada Muni entered one of these immense palaces. As mentioned, the discovery of Dwarka – an important historical landmark of India – has set to rest the doubts expressed by historians about the historicity of Mahabharata and the very existence of Dwarka city. This is the reason Sri Adi Sankaracharya, the profound founder of Sanatana Dharma has henceforth made this one of the Char Dham (4 Most Prominent Sacred Sites) in India which when heard, visited gives us the divine vibrance in realizing the Supreme. Request the readers to cherish the beauty of our Ancient India with its most beautiful culture and heritage and make a visit to this place once during our lifetime. Anyone interested to visit this sacred place can follow the below Itinerary Link which will fulfill one’s visit in a systematic way. As a matter of fact, this was the plan I followed and visited in the same fashion. Hope you get a transcendental experience reading this small attempt of my sharing divine journeys. Please let us know if you need any information or give me a feedback if you think I might cope with in future. In the name of Lord Sri Hari. Om Tat Sat. An ancient drawing of Puri Jagannath Temple. Jagannatha Puri, also known as Shree Purusottam-Kshetra or Sankarshana Kshetra , one of India’s most popular pilgrimage sites located in Orissa. Belonging to the 11th century and enjoying the honor of being one of the ‘char dhams’, the pilgrimage that every Hindu intend to visit; Jagannath Temple is the honor of Puri and Odisha (Orissa). The holy sight of Lord Jagannath, accompanied by Subhadra and Balabhadra raises loads of joy among the devotees. The two gods and the goddess of the temple are ornamented in accordance with the occasion and seasonal change. The structural design of the temple can be found to be in pyramid shape. The Simha Dwara of the Temple where the Lordships come out during the Annual Ratha Yatra Festival. The four directions of India are sanctified by four main holy places (dhāma) dedicated to the worship of God. “Dhāma refers to a place where one can immediately contact the Supreme Lord.” (SB 4.8.42 p.) Every year millions of pilgrims and tourists visit these four sacred spots: Sri Badarinatha Dhama in the north; Ramesvaram Dhama—south; Dvaraka Dhama—west; and Jagannatha Puri Dhama—east. The temple of Jagannatha Swami, Baladeva and Subhadra is the crown jewel of all Oriyan temples and the centerpiece of the whole town of Jagannatha Puri. The Jagannatha Temple is the life and soul of every local resident who directly or indirectly benefits from it. About the four holy dhāmas of India, it is said that Lord Visnu meditates at Badrinatha; rules at Dvaraka; sleeps at Rameswaram and eats at Sri Ksetra Nilacala (Puri). Vimana Gopuram or the Central Dome of the Jagannatha Puri Temple. Like the holy Ganga and Yamuna Rivers, the ocean at Puri is a purifying sacred place of pilgrimage. The ocean here is not just a pilgrimage place; it is a mahā-tīrtha, a great pilgrimage site. Visnu temples (also Kṛṣṇa, Rama, Nrsimha and Narayana) are identified by the cakra (disc) gracing the pinnacle of the temple dome (shikara) towering above the central and main Deity altar. The cakra (Sudarsana disc) above Jagannatha Deva’s temple is called “Nila-cakra” because it appears dark blue or green in color. The day before the Rath Yatra Festival starts. Lord Garuda have darshan of Jagannath Puri Temple. The main temple of Jagannatha Swami soars 214 feet high above the road level. The temple complex encompasses 450,000 square feet contained within two rectangular walls. This ancient temple combines two styles: South Indian (Dravidian) and North Indian (Nagara). The fine quality of the temple architecture is easily seen outside, and especially inside at the borders of the door frames wherein the 24 forms of Visnu are beautifully sculpted in stone. “Every night I saw demigods coming down to worship the presiding Deity of Lord Nila Madhava with fragrant flowers and devotional prayers. Although I personally do not have any qualifications, just by living in Purusottama-ksetra I developed intense love for Bhagavan Sri Kṛṣṇa.” Enchanted by the story, King Indradyumna deputed the brahmin Vidyapati to search for the Lord in Orissa. Majestic and Gigantic Chariot Wheels of the Ratha. Vidyapati soon left Niladri and returned to Avanti to give King Indradyumna the good news. One day, while Visvavasu was collecting forest articles to worship Nila Madhava, a huge cyclone ripped into Puri uprooting trees and throwing sand everywhere. When the violent storm subsided, the Deity of Nila Madhava had disappeared! Overwhelmed in loving separation, the tribal chief Visvavasu searched madly through the forest crying for the Lord. An aerial voice announced, “Nila Madhava will no longer be seen. The Lord will reappear in another form when King Indradyumna arrives. Be patient.” King Indradyumna gathered all his belongings and subjects and set out for Orissa. Upon entering the state of Orissa, the royal procession was met by the King of Utkal (present day Orissa). Unfortunately, the sovereign of Utkal conveyed some bad news: “O King Indradyumna, it is our good fortune that you have come to this sacred land. However, recently, a vicious storm created havoc in our country and covered the area of Nilacala with sand. Hence, the Deity of Nila Madhava was lost.” Narada Muni, who was traveling with him, comforted the disconsolate King Indradyumna saying, “Sri Kṛṣṇa reveals Himself to His loving devotees. Sarvam Jagannath: Vendors selling wooden deities of Jagannath, Baladev & Subadra. Be assured, your desire to see the Lord will be realized upon reaching Purusottama Ksetra. Lord Brahma told me that the Supreme Lord will appear again in a unique form especially to fulfill your desire.” Leaving their chariots, Narada led the king to a clearing amidst the dense forest surrounding Nilagiri Hill. There they saw a ferocious Deity of Lord Nrsimhadeva. Narada worshiped that Deity, and showed King Indradyumna the kalpa-vrksa tree under which Lord Nila Madhava previously stood. An aerial voice advised the king to follow Narada’s orders. Narada instructed the king to build a temple for Lord Nrsimhadeva and perform one thousand horse sacrifices. Meanwhile, Narada Muni went to the heavens and returned carrying a Deity of Nrsimhadeva to install in the temple built by Indradyumna. [This Nrsimha Temple is on Grand Road directly north of the Gundica Mandira] During the final sacrifices, some citizens informed the king, “We have just seen a wonderful tree floating in the ocean’s waves. From a distance, we perceived its sweet smell and dazzling effulgence. Looking closer, we found the symbols of Visnu on that extraordinary log.” King Indradyumna collected that tree and kept it on an altar in the Gundica Mandira. A supernatural voice proclaimed, “O King! A carpenter will come to carve the Lord’s proper form. Play music to cover the sound of carving and allow the carpenter twenty-one days to complete the work. Disaster will follow if anyone interrupts the carving.” After sometime an old carpenter arrived and fashioned four Deities. When the work period ended, King Indradyumna beheld the beautiful forms of Lord Jagannatha, Balabhadra, Subhadra and Sudarsana. After erecting a lavish temple, Narada and the king went to invite Lord Brahma to inaugurate it. At Brahmaloka, the gatekeeper had Narada and the king wait until Lord Brahma finished the raga that he was singing. “O King,” said Brahmaji, “Since you left the earth, hundreds of different kings have come and gone. Now return to Purusottama-ksetra and I will soon come when everything is ready.” To the visiting demigods, Lord Brahma said, “For the first half of my life, the Lord appeared as Nila Madhava, and from now on He will be worshiped in the wooden forms of Jagannatha, Baladeva, Subhadra and Sudarsana cakra. The Skanda Purana states that Ratha-yātrā began a few billion years ago in Satya-yuga during the reign of Svarocisa Manu, the second of the fourteen Manus. Every year Lord Jagannatha enacts the Ratha-yātrā (Mahavedi Yatra) in order to see His appearance place at the Yajna Vedi in the Gundica Mandira. (Skanda P. 29.25-44) In Orissa, the Ratha-yātrā festival is known as Jagannātha’s journey to Guṇḍicā. Although outsiders call it Ratha-yātrā, the residents of Orissa call it the Guṇḍicā-yātrā in honor of Gundica Devi, King Indradyumna’s queen, who purportedly initiated this festival. The songs of many Oriyan poets state that Ratha-yātrā started with the request of King Indradyumna’s wife named Gundica. Ratha-yātrā is also known as the Patita Pavana Mahotsava because non-Hindus get the opportunity to see Lord Jagannatha. Surprisingly, these gigantic carts are rebuilt every year. Carpenters work on the Grand Road near the temple for two months preceding the festival, meticulously building each cart in the same way year after year. The chariot designs and decorations follow ancient traditions passed down from father to son. The old carts are used for cooking Jagannatha Swami’s daily bhoga. The kalasa (pots above the canopies), the wooden charioteer drivers (sarathi), horses and fourteen deities arrayed around the carts are only remade every twelve or nineteen years when new Jagannatha Deities are prepared. To make the three chariots, 125 carpenters (hereditary craftsmen), spend 58 days carving 2,188 pieces of wood. Each chariot is pulled by four stout ropes of four inch diameter and 250 ft. length. Nandighosa: This is the name of Jagannatha’s chariot which flies the flag of Garuda holding a snake in its beak. The cloth canopy is yellow and red. The chariot is made of 832 wooden parts, all fitting without nails, but sometimes iron clamps are inserted for reinforcement. Taladvaja: This is the name of Balabhadra’s chariot which flies the emblem of a ploughshare (hala) on its flag. The canopy is green and red. Padmadvaja: This is one of three names (Devadalana, Deviratha) of Subhadra’s chariot which flies a flag with a lotus flower. A black and red canopy shields Subhadra and Sudarsana who ride on this cart. During the Annual Ratha Yatra Festival where the Lordships from the Sanctum Sanctorum give darshan to devotees. The largest crowd in Puri is seen during the Car Festival of Jagannatha which takes place every year in June-July. Jagannatha of Puri is strikingly different from all other deities worshipped by the entire Hindu world, mainly for the reason that Jagannatha represents all the gods and goddesses known to the entire Hindu world, either directly or indirectly. He is considered to be the highest object of worship by the followers of all the religious cults that come within the purview of Hinduism. For example, he is Siva for a Saivite, Ganapati for a Ganapatya, Kalika for a Sakta and so on and so forth. This kind of integration of religious cults and creeds belonging to Hinduism is not to be seen anywhere else. The famous beach of Puri known to cure many diseases when one takes bath here. The second great attraction of Puri is the sea beach acclaimed to be one of the best sea beaches of the world. A number of beach complexes have developed on the sea at Puri & nearby. Jagannatha Swami, Baladeva and Subhadra stay here for seven days every year during Ratha-yatra. The Deities sit upon a plain chlorite stone siṁhāsana that is four feet high, nineteen feet long. It is called Gundica in honor of King Indradyumna’s queen named Gundica Maharani. In the language of the Śabaras, the tribal woodsmen of this region, the word kun means “he” and dījā means “the trunk of a tree.” Kundījā means, “He, Lord Jagannatha, came from the trunk of a tree.” Overtime, kundījā became guṇḍijā and now guṇdicā. On the day before Ratha-yatra, Mahaprabhu smeared sandalwood pulp on His personal associates, gave each a broom and went to Gundica to clean the temple for the arrival of Lord Jagannatha. Mahaprabhu did not engage His guru-varga in any of the difficult tasks like carrying pots of water. Rather, they were engaged in cleaning alongside Lord Gauranga with the water brought by other devotees. Except for Nityananda, Advaita, Svarupa, Brahmananda and Paramānanda Puri, all the other devotees carried water. One can also find the ancient Adi Sankara’s established Peetham here known as Goverdhana Peetham which is one of four peetham, the other three being Joshi Math in Badrinath, Dwaraka Peetham at Dwarka, Rameswaram peetham. Entrance to this Adi Sankara’s institution. As I mention in my blog posts, there is always a lot to tell, lot of know of our temples about our heritage and culture which is being followed since ages. As the quote goes on saying “Seeing is believing”, one can only experience the true bliss and divinity within only when one visits such sacred sites. Request the readers to share your opinions, thoughts and feedback on this. In the service of Lord Hari.! – Harish Pakala. Information, B/W photo of Jagannath Puri: Internet, Books and Self Experience. Srirangam : The World’s Largest Functioning Temple. Sri Ranganathaswamy Temple, is one of the most illustrious Vaishnava temples in the country, dedicated to Ranganatha, a reclining form of Hindu deity, Lord Vishnu. Situated in an ethereal setting on the island of Srirangam that is bounded by the two rivers of Cauvery and Kollidam (a tributary of Cauvery), this living temple and sacred centre of pilgrimage is counted as the first and foremost among the 108 Divya Desams dedicated to Sri Maha Vishnu. Srirangam is the foremost of the eight self-manifested shrines (Swayam Vyakta Kshetras) of Lord Vishnu . This temple is also known as Thiruvaranga Tirupati, Periyakoil, Bhoologa Vaikundam, Bhogamandabam. In the Vaishnava parlance the term “Koil” signifies this temple only. The temple is enormous in size. The temple complex is 156 acres in extent. It has seven prakaras or enclosures. These enclosures are formed by thick and huge rampart walls which run round the sanctum. There are 21 magnificent towers in all prakaras providing a unique sight to any visitor. this temple lies on an islet formed by the twin rivers Cauvery and Coleroon. More importantly, it is not just a temple but a temple-town, unique in its Sapta-Prakaram formation, a temple centred settlement pattern that comprises of Sapta (seven) concentric rectangular enclosures or prakarams formed by thick and huge rampart walls that run round the sanctum sanctorum in which the deity presides. While the inner five enclosures of the complex constitute the temple, the outer two enclosures function as the settlement. Srirangam can be considered the biggest functioning Hindu temple in the world, as it covers an area of about 631,000 square metres (6,790,000 sq ft) with a perimeter of 4 km (10,710 ft). Angkor Wat is bigger but non-functioning temple due to its ruins and non existent of the deities as they are no more. “Gopuram” (Tower) of the temple is called Rajagopuram (literal meaning Royal tower) which stands majestically above all other towers with a height of 236 feet and hence becomes the tallest tower in Asia built by Agobila Mutt, Srirangam. It is believed that the shoreline of Sri Lanka can be seen from the top of the Srirangam Rajagopuram. Srirangam is admired as the city of festivals. Lord Rama performed aradhanam (pooja) to Vishnu’s idol (deity in a reclining posture). As a symbol of love he gifted the idol to Vibishana (brother of Ravana of the Hindu epic Ramayana) to take back with him to Lanka. There was a condition that he could not set the idol on earth and if he did it would seat itself permanently. Vibishana took this idol and while travelling towards Lanka, came upon the banks of the river Kaveri. He placed the idol on banks of river Kaveri, while an utsavam was in progress. When the utsavam got over, the Lord refused to move as he loved the place (Srirangam). When Vibhishana requested him to come along with him, the lord refused but promised to bless Vibhishana by always facing South (the direction of Lanka, home to Vibhishana) Hence it is that the deity (in a reclining posture) faces South. Then Chola kings Dharmavarcholan and Killivalavan developed the shrine into the big temple seen now. King of Vijaya Nagar “Krishna Deva Raya” realized the importance of this sacred city and prioritized Srirangam as equal as Thirupathi and bequeathed a plenty of treasures, jewels and lands to the Srirangam temple. During his period the Srirangam temple was well reformed and many plans were executed for the growth and people welfare and so Srirangam got developed rapidly. Apart from the presiding deity Lord Ranganathar, the temple complex comprises of many other sannathis and about 53 upa-sannathis. Apart from the 7 prakarams with massive walls, the Temple Complex has 21 very colourful sculpted gopurams (consecrated gateways with towers), 50 sub shrines, 9 sacred pools, gilded Vimana (dome) over the sanctum sanctorum of the presiding deity, and other interesting features such as fresco paintings. Mandapams (Halls): There are many mandapams at Sri Ranganathaswamy Temple. One of the finest is the Hall of 1000 pillars (actually 953), an example of a planned theatre-like structure. Made of granite, it was constructed during the Vijayanagaraperiod (1336–1565). The great hall is traversed by one wide aisle in the centre for the whole of its greater length, and intersected by transepts of like dimension running across at right angles. There still remain seven side aisles on each side, in which all the pillars are equally spaced out. The above collections is from the Sri Rangam Temple Museum having some of the oldest collections of deities gifted by the greatest kings centuries before. The red colored sandal on the bottom right was gifted to the Lord Ranganatha around 500 years back when one of the devotee who made this got in a dream that the Lord requested him to make one. Devotees offering several varieties of flowers to Thayar at the Thayar Sannidhi at the temple. Indeed the temple almost conducts celebrations to the utsava murtis of the temple. The magnificent golden vimana gopuram under which the Mula Virat(Self Manifestivated Deity of Sri Ranganatha resides. The name of the Gopuram called as Pranavakara Vimana Gopuram. This is a Gold plated dome having four forms of Sri Maha Vishnu which are considered great importance according to Pancharatra Agama which the Sri Rangam Temple follows. These four forms are Vasudeva, Sankarsana, Pradyumna and Aniruddha. Vasudeva is believed to be the most important among these four. The Pranavakara Vimana also has the image of the four armed Paravasudeva, with Goddess Lakshmi on this Chest. The deity hold Sanka and Chakra in his upper hands while the lower hands are placed on the two lotuses. View of the Raja Gopuram from inside the temple. The temple has seven prakaras (elevated enclosures) with gopurams articulating the axial path, the highest at the outermost prakara and the lowest at the innermost. In historic times, just after the construction of this temple, the city of Srirangam lived completely within the walls of this temple and hence is quoted as an example of Hindu religious utopia – during its peak of existence. The above sculpture shows one of the greatest pastime of Krishna dancing on the snake Kaliya to protect the inhabitants of Vrindavan and river Yamuna from poisoning. The temple complex has been nominated as a UNESCO World Heritage Site, and is in UNESCO’s tentative list. The above meticulously carved scultpures is in the Seshagirirayar Mandapam which is a 100 pillared hall with several interesting and small sculptures which includes heavenly dancers, musicians, war scenes and several others. Some of the sculptures also include Nayak Kings in this mandapam. The above circular tank is called the Chandra Puskarini which is the temple tank inside the temple. There are several shrines near to this which include Santana Gopala Krishna and Radha Krishna. Veda Vyasa is also seen in seated posture. Krishna is actually seen as Venu Gopala with two hands holding the flute with Radha embracing Krishna. One can also find the Kondandarama and paramapadanatha housing beautiful stone images of Lord Rama, Lakshmana and Sita which are almost Life size along with the Utsava murtis of the three deities. This entrance to the main sanctum is also called paramapada vasal which is opened only on Vaikunata Ekadasi Day. A perfectly carved sculpture of a huge elephant being controlled by elephant controller. Yet another exceptional way of showcasing the arts and skills. There is always lot to write, lot of tell and mention about this World’s Largest Functioning temple which one cannot describe unless one experiencing it physically. This is the temple closest to my heart and soul and would be my favorite temple. No wonder this temple is called Bhu-loka Vaikuntam(Heaven on Earth) for its magnanimous and splendid beauty. This small attempt of mine to provide the readers a gist or a glimpse of this temple is to attract people of all kinds including historians, archeologists, art lovers and in general who would love to cherish and absorb the heritage and culture of our Sacred India. Any feedbacks, more information about this temple is most welcome in the comments section below. In the Service of Lord Hari!!! – Harish Pakala. Madurai Meenakshi is nominated for one of the Wonders of the World, this temple of Meenakshi Amman in Madurai stands apart in terms of exuberance and excellence. A master piece of construction, it is believed that Lord Siva himself descended upon this holy place to seek the hand of Goddess Meenakshi, a place where the Celestial Wedding took place, a place where Dravidian culture and Hindu Tradition meet. MADURAI- the name at once evokes a feeling of devotion and awe; devotion towards Mother Meenakshi and Lord Sundareshwarar, the presiding deities at the most famous Madurai Meenakshi Temple of Tamil Nadu and awe at the long, uninterrupted history of literature, art and architecture that flourished in this Temple town from Pre-Christian era to the present day. The temple forms the heart and lifeline of the 2500 year old city of Madurai. The enormous temple complex is dedicated to Shiva, known here as Sundareshvara and his consort Parvati or Meenakshi. The original temple was built by Kulasekara Pandya, but the entire credit for making the temple as splendid as it is today goes to the Nayaks. The Nayaks ruled Madurai from the 16th to the 18th century and left a majestic imprint of their rule in the Meenakshi – Sundareswarar Temple. As one enters into the Sundareshwar Sactum of the Temple, one witnesses the amazing Dwajasthambam standing tall and radiating gold. One can find enumerable architectural sculptures on every single wall inside this Sanctum. Foreign visitors will be able to visit until this Sanctum. This Mandapam is famous for depicting all the 25 forms of Lord Shiva. Being situated just in front of the main sanctum and containing as it does the Nandhi Mandapam and tghe dwajasthambams, it has all its sculptures related only to Shiva forms. The scultptures speak of the divine atmosphere that prevailed at that time. All the faces in the sculptures show warmth and flow. It is a conglomeration of all the divinity in the three worlds that is depicted in a grand manner in this Mandapam. Going through this sanctum inside in the main Sundareshwarar sannidi where one would be able to have darshan of Lord Siva. The above picture is the deity of the fierce Bhadrakali. Small balls of butter are hurled at the deity by the devotees to appease her anger. The Sculpture of Urdhva Thandavar is found in the southern portion of the easternside of the Kambathadi Mandapam. It represents one of the dancing forms of Shiva. This mode of dancing in which Shiva lifted His right leg straight up to the level of His head refers to a contest between Him and Kali as to who wa the better dancer. As Kali danced equally well in all the forms of dancing, Shiva finally began the Urdhva Tandavam, which, ofcourse, Kali in her modesty could not perforṃ. According to a mythological story, the Pandyan king Malayadhwaja and his queen Kanchanamala performed the ‘Putra Kameshti Yaga’ for a child. At the suggestion of Shiva, his eternal consort Parvathi consented to become the child of the pious king. She rose effulgent from the sacrificial fire as a little girl, with three breasts; the third of which would disappear when Shiva set his eyes on her. The girl was named Thadathangai and she was brought up as a ‘princess’ under divine instructions. Princess Thadathangai succeeded her father to the throne and led armies on successful campaigns of conquest. In her last campaign in North India, she challenged Shiva himself at Kailas, but when She saw the great Lord, She fell in love with him. The bridegroom followed her home, married her, took the name Sundara Pandya and together they ruled Madurai. According to a mythological story, the Pandyan king Malayadhwaja and his queen Kanchanamala performed the ‘Putra Kameshti Yaga’ for a child. At the suggestion of Shiva, his eternal consort Parvathi consented to become the child of the pious king. She rose effulgent from the sacrificial fire as a little girl, with breasts; the third of which would disappear when Shiva set his eyes on her. The girl was named Thadathangai and she was brought up as a ‘princess’ under divine instructions. Princess Thadathangai succeeded her father to the throne and led armies on successful campaigns of conquest. In her last campaign in North India, she challenged Shiva himself at Kailas, but when She saw the great Lord, She fell in love with him. The bridegroom followed her home, married her, took the name Sundara Pandya and together they ruled Madurai. With all the celebrities from the three worlds descending upon earth for the occassion of the celestial wedding, the Kambatthadi Mandapam(which is before the Sundareshwarar Sannidihi) offers the best sculptures of Divine Stories. This Mandapam depicts all the 25 forms of Lord Shiva. The Scene below shows Shiva standing on the right with his right hand just holding Meenakshi’s right hand while Sri MahaVishnu giving away his sister, ceremoniously shown by the way of pouring water as part of the Kannikadanam, out of a pot. Behind the wedding group is sculptured a beautiful decorative tree perhaps the Karpaga Vriksham presented to Meenakshi presented by Indra during her digvijayam. Shiva is an eternal bridegroom and Sakthi is the eternal bride. The 51 Lingam which are known as Akshara Lingam located on the Sundareshwar Shrine of the Temple. There are in all eleven towers to this temple, the largest and most beautiful being the one on the southern doorway. Rising to a height of about 70 metres, this impressive ‘gopuram’ is by far the most ornate and florid of the Dravidian towers. It has nine stories and crowded with grinning gargoyles and gryphons that perch on the ornate curved edges. The surface of the ‘gopurams’ on the southern door way is covered with plastic figures of deities and semi- divine characters, freely sculptured and drawn from Hindu mythology representing the appearance of a pulsating mass of masonry. With frequent renovations and additions being done down the centuries, there are more than 1,600 sculptured figures. If the temples of South India were to be represented by a symbol or an insignia, the Temple Tower or the Gopuram will, by far, be the obvious choice. Sculptor’s talent was showcased in its Mandapams and also History and Divine Stories were recorded for posterity. They carried a wealth of Puranic representation and history of the time in the form of stuccoes. It was in this pond that the Golden Lotus for Indra to perform his pooja bloomed. This pond is also known as Adhi Theertham, Sivaganga and Uthama Theertham. This pond is situated within the temple complex. This theertham was created by Lord Sivaperuman by thrusting his Soolam (three ptonged spear) into the earth in deference to the plea of Nandhi Devar and other deities. This pond is believed tyo have acted as the judge in deciding the aestheric merit of any literary work during the Sangam Period. A plank carrying the literary work would float if acceptable and sink if not worthy. The corridors around the pond have mural paintings of colorful depiction of the divine sports of Lord Sundareshwarar. Since this theertam was created before all other theerthams it is called Adhi Theertham and because it is much greater importance than all other theerthams, it is also called Parama Theertham as Gnana Theertham because it confers prosperity on all who bathe in it. As it grants heavenly abode it is also called Mukthi Theertham and as Sivaganga because the water from Ganga from the head of Lord Siva confluences with it and as Uthama Theertham because of its purity than any other theertham. If the devotees bathe in the waters of this pond of Golden Lotus on Amavasya (new moon) day, the first day of the month, days of eclipse and other auspicious days and worship the Lord, they will be blessed with all their aspirations for success. The Corridors around the Temple have mural paintings of colorful depiction of the divine sports of Lord Sundareshwarar. The greatest part of the entire temple is this Thousand Pillar Mandapam. It can be said that no other grand structure has been made since this was built. The sheer largeness of the hall and the towering pillars make visitors gape in awe. Uthirai: Inside the 1000 pillared Mandapa. The Thousand pillared Mandapam is a huge edifice occupying an area of 60,000 square feet. The Statue shown standing opposite the dance guru Arjuna as a transgender(in the story of Mahabharata), is Uthirai, his disciple. As she dances she is seen holding the tassel at the end of her neatly long hair, with elegance. One would keep staring at this figure for ths sheer engaging beauty of its crown, the jewelry and the lovely dress. The above sculpture shows Shiva’s right hand has an arrow with Lord Vishnu’s face as its centre. It is shown as virtually carrying fire at edge. The Top left sculpture which is Lord Muruga with four arms riding his peacock is something wondeful in the 1000 pillar mandapam. The spirited image is full of action and shows that He is going to war. The back hands possess Sakthi and thunderbolt. The front right hand is held aloft as if commanding while the front left holds the reins of the peacock. The Top right sculpture is of a Hunter with bow on his shoulders. Thadagathai went on her venture, waged battles and won even supernatural beings(Devas), and turned her attention to Lord Shiva who was on Mount Kailash and invited him for a battle. This statue shows Lord Shiva in a ready to go state. His hands are holding the deer, the tomahawk, the bow with its arrows and is in the form of Thribanga(three bends) putting one foot forward and is in the Aaalida move as shown above. The high point of Meenakshi temple is its celebrated ” Court of Thousand Pillars “. Built around the year 1560A.D ., it is a great work of structural engineering as well as sculpture and art. Every one of its thousand pillars is subjected to an amazing variety of ornate carvings. the sculptured figures of a nomadic tribe called Kuravi and his wife at the entrance itself are very interesting. There is an eye-catching sculpture of a main carrying a woman on his shoulders . From any point inside the Hall of pillars, it presents a magnificient view. The hall’s other statues explore the entire range of human emotions. Some of the sculptures are immense, the stone gleaming with the antic lustre. Delicately carved sculpture at the corridors of the Temple. One should remember that a Temple serves not only as a place of worship or an example of fine architecture; but also a piece of music and paintings. The Temple aging more than 2000 years and still standing strong to give devotees and visitors truly a memorable and everlasting experience. Temples provide an excellent platform for Social Networking. Special Occasions were created that offered opportunities for people to meet to mingle in the temples. View of the Meenakshi Temple surrounding the Lotus Pond, Corridors, Gopuram and devotees. This ends my short yet sacred visual travel to the Madurai Meenakshi Amman Temple, Tamil Nadu. Hope the readers like the post and make it a point in their life time to visit and experience the divinity within. Whatever efforts I have put in to present is just a gist of this Great Temple of Madurai Meenakshi. However, when one visits this temple physically, there is no doubt in having a breath taking view of this amazing temple, architecture, art and culture. Please leave your opinions, thoughts and ideas which can improve my effort in Sacred Soul Diaries. Tanjavur Brihadeshwara Temple turns 1000 year. Tanjavur was at the height of its glory during the Chola period between the 10th and the 14th century and became a great centre of learning and culture. The ancient city of Tanjavur or modernly called Tanjore reminds us of its Art, South Indian Religion and most famously known The Tanjavur Big Temple built by Chola Kings. Tanjore Brihadeeswara temple is also known as RajaRajeswara Temple Rajarajeswaram and Peruvudayar Temple or Periya Kovil or Big Temple built in 1010 CE by Raja Raja Chola I during the Chola Dynasty. It has turned 1000 years in 2010 and still standing tall. We can imagine how much devotion, tradition and science people in the past had thousands of years back. This is a solid proof that we do not need to underestimate our ancient culture or traditions. Designed by Sama Varma, the architecture of Brihadeeswara temple is unique in that the temple casts no shadows on the ground at noon during any time of the year. This temple is a tribute and a reflection of the power of the Chola King, Raja Raja Chola I. This temple remains as one of India’s largest and Indian architecture’s greatest glories. It is also a part of UNESCO World Heritage Site as “Great Living Chola Temples”. The entrance Gopuram(Tower) to the Temple. This great temple is India’s one of the most prized site for its architecture. It stands in the middle of fortified walls added probably in sixteenth century. The temple tower, which people call as Vimana, is 216 feet or 66 meters high. It is also one among the tallest tower in the whole world of its kind. The Complex Carvings on the Gopuram sculpted on a Single Stone. Lord Brihadeshwara (Shiva) Lingam inside the Sanctum Santorium of the Temple. The Lingam measures 9 ft in height, 23.5 ft in circumference. The Lingam was brought from the shores of Narmada River. This Lingam is also called as “Raja Rajeswara Mudaiyan” because of its bright appearance. There is one statue of a sacred bull or Nandi at the entrance of this temple measuring 12 feet high, 19.5 feet long and 18.25 feet wide. It is the result of a single rock carving. The Nandi is a monolith weighing about 25 tons and the stone is said to have come from a bed of Gneiss at the foot of Pachaimalai near Perambalur. Another version is that the stone was brought over from the bed of the River Narmada in the north. No one till now knows how people in those days were able to carry this much massive stone and put it on the Mandapa. This always remained a mystery till now. There is a tradition that the Nandhi is growing in size with the progress of time. It was feared it might become too large for the Mandapam erected over it and a nail was driven into the back of it, and since, its size has remained stationery. Two portrait statuesques on the front pillars of the Nandhi Mandapam are pointed out as those of Sevappanayakan (the first Nayak ruler) and of his son Achyutappa Nayak. The intricate carvings, the sheer magnitude of the structure, the vast temple complex andits stunning beauty are truly unparalleled. The entire structure of the Brihadeeswarar temple is made of granite, whose nearest source is near Tiruchchirapalli, which is nearly 60 kms to Thanjavur’s west, where temple is. The basement of the structure which supports the tower is 96 feet square. The sikhara or cupolic dome is octagonal in shape and crowns the Vimana. The gilded Kalasa or finial, over dome is 12.5 feet high. It is believed that the sikhara and the stupi does not throw on the ground. The dome rests on a single block of granite, of 25.5 feet square. Two Nandis, each measuring 6.5 feet by 5.5 feet beautify each corner of the stone which is estimated to weigh about 80 tons, and is believed to have been conveyed to the top of the tower by means of a inclined plane commencing from Sarapallam (scaffold-hollow), four miles north-east of the city. The solid base of the temple raises about 5 meters, above which stone deities and representatives of Shiva dance. The outer wall of the upper storey is carved with 108 dance karanas – postures of Bharathanatyam, the classical dance of Tamil Nadu. The “Kumbam”, the rounded apex dome on top, is made from a single stone that weighs approximately 80 tonnes (72,575 kg). The Kalaśam on top of the dome is 6 feet tall. The main exclamation about the dome is how could the builders of Tanjore big temple were able to place the dome at the top of the Gopuram in Tanjore big temple. There were no cranes or any high end equipments used in those days to do these works. The only thing that can help is the elephants. The dome of Tanjore big temple is constructed in such a way that the shadow of the Tanjore big temple Gopuram will not fall on the ground. It will just fall on itself. This particular planning and type of construction is not an easy task to go with. The great Vimana is of the Dravidian style of architecture. It rises to a height of about 216 feet, a tower of fourteen storeys, finely decorated with pilasters, niches and images of gods of the Hindu pantheon. The temple tower is 216 ft high (60.96m) and is among the tallest of its kind in the world. Rajaraja-I a great devotee of Lord Shiva called the Sri Vimana as Maha Meru or South Kailash. The leaning tower of Pisa, which is just a slanty tower due to a building defect, is hailed as one of the wonders of the modern world, while here is a 1000-year-old architectural marvel that far surpasses any slanty building! All glories to our country’s rich heritage, culture and architecture. Hence rightly called…. Incredible India!! The Architectural Marvel of India: Hampi. On the banks of Tungabadhra River of Hampi. HAMPI, the once capital of Vijayanagara Dynasty(1336-1565) is a place for inspiration as it boasts the grandeur sculptural and marvelous architecture throughout the city. Hampi is one of India’s most striking and fascinating archaeological sites, once the imperial capital of Vijayanagar in the 14th century. Today it is recognised as a UNESCO World Heritage Site attracting thousands of visitors every year from all over the world. Hampi itself is spread over a huge site and dominated by the Tungabhadra River, running through the city. There are over 500 monuments from beautiful Hindu temples and extravagant palace ruins, to royal pavilions and even bastions. Locals at Hampi say it would atleast take 2 months to cover all the monuments and ruins at Hampi. However, during my two days visit to Hampi, I’ve covered the maximum places that I could and would be mentioning the most interesting and amazing monuments of Hampi. Virupaksha Temple in Hampi is a must visit for history buffs and religious people. The temple is located on the banks of the river Tungabhadra and is one of the structures in the Group of Monuments in Hampi, which is a designated UNESCO World Heritage Site. Inscriptions on this temple are dated back to the 9th and 10th century. Virupaksha Temple, which is dedicated to Lord Shiva, is a main pilgrimage centre in Hampi and is known as Virupaksha. The temple was constructed by Lakkana Dandesha and was small originally. During the period of the Vijayanagara kings, the temple was expanded. More structures and complex were added during the Hoysala and Chalukyan eras to make it as grand as it looks today. Side angle of the Main Gopuram. 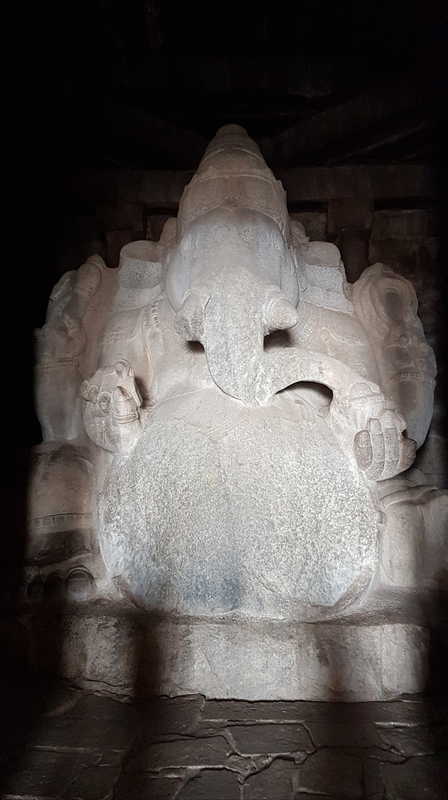 This giant statue of Ganesha was carved out of a huge boulder at the northeastern slope of the Hemakuta hill. The belly of this statue resembles a Bengal gram (Kadalekalu, in local language) and hence the name. A sanctum is built around the statue. The pillared hall in front of this sanctum is as charming as this giant statue itself. The open hall constructed by unusually slender and tall pillars. Each of them is highly ornate with mythical themes. 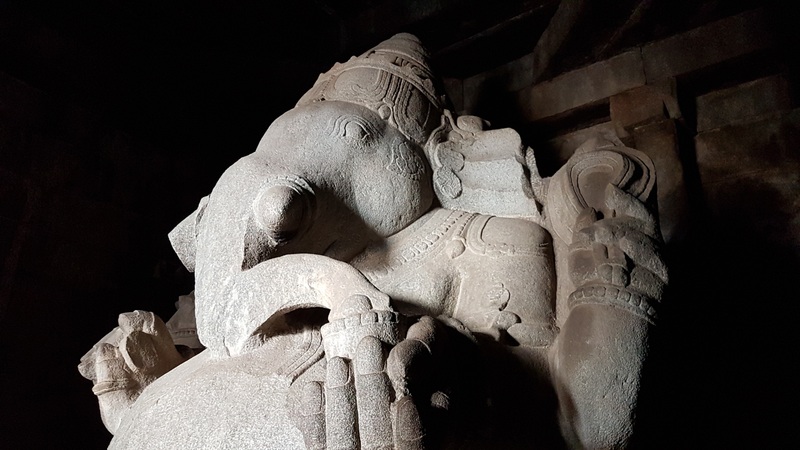 This 4.5 meters (15 feet) tall statue is one among the largest sculptures in Hampi. The pillared hall is a vantage point to survey the environs, especially the Hampi Bazaar and the foothills of Matanga Hill. The main Deity inside the Temple. A bit north of Sasivekalu Ganesha is another giant statue of Ganesha, called The Kadalekalu Ganesha. A bit south of Sasivekalu Ganesha is the Vishnupada shrine. All these are walkable from one to another and can be covered in 30-45 minutes. A Single Stone Ganesh Deity. Backside of the Deity where one can see Parvati Devi sculpted on the back. This temple was built by the king (Krishnadevaraya) in 1513 AD to celebrate the conquest of the eastern kingdom of Udayagiri or Utkala (in the present day Orissa state). The main idol installed in the temple was the figure of Balakrishna (Lord Krishna as infant). This idol is now displayed in the state museum at Chennai. A huge slab installed inside the courtyard of the temple states the story of this temple and the conquest of Ulkala. Krishna Bazaar in front of Krishna Temple. This is one of the must see sites in Hampi. The carvings are especially spectacular with the Yalis (the mythical lion) on the pillars and the entrances to the temple hall flanged with impressive carvings of elephant balustrades. Just opposite to the entrance of the temple, one can find Krishna Bazar. It is said that it was once where people used to sell precious stones, ornaments including daily vegetables. Also, it is was the custom of the people during that time when people before starting to sell anything in the bazaar used to offer some of the items and put them in a huge stone made casket and only after offering it to the deity i.e Sri Krishna used to start making their business. The huge stone made casket is still present in front of the temple. This indicates the enormous amount of devotion and sincerity people had during the rule of Krishnadevaraya Dyanasty. A Single Stone Huge ShivaLingam inside the Water. According to Hindu mythology the River Ganga (Ganges) was brought from heaven to earth to quench the drought. But the river was so forceful that it could split the earth into two pieces if allowed to fall on earth. Lord Shiva consented to take the impact by allowing the torrent of Ganga to fall on his matted hair. Thus helping to release a smooth flowing river on to earth from his hair. As an iconic representation of this, in Siva temples you can spot a dripping pot hanged over the Linga. This is the largest statue in Hampi. Narasimha is sitting on the coil of a giant seven-headed snake called Sesha. The heads of the snake acts as the hood above his head. The god sits in a cross-legged Yoga position with a belt supporting the knees. Sometimes this is referred as Ugra Narasimha (i.e. Narasimha in its terrifying form). The protruding eyes and the facial expression are the basis for this name. Narasimha (means half-man’half-lion in local the languages) is on of the ten incarnations (avatar) of Lord Vishnu. The original statue contained the image of goddess Lakshmi, consort of the god, sitting on his lap. But this statue has been damaged seriously during the raid leading to the fall of Vijayanagara. Even the damaged portion of such a large statue of Lakshmi carved on his lap is missing. Probably it may be laying around in tiny pieces. But the goddess’s hand is visible resting on his back in embracing posture. If you get a chance to go inside this enclosure, it is possible to see the hand of the goddess. Even the nails & the rings on her fingers are so perfectly executed. Lion face of Lakshmi Narasimha also sometimes called as Unganarasimha (the ferocious Narasimha. Somehow this single statue alone can demonstrate at the same time how creative and destructive the human mind can be. The Hindu mythology has a tale of Narasimha’s origin which is a part of Lord Vishnu’s Dasavatar. The Lotus Mahal or Lotus Palace is a unique structure located among the rich architectural ruins of Hampi. This majestic structure is a part of the Zenana Enclosure, a secluded area reserved for the royal ladies of the Vijayanagara Empire. The Lotus Mahal is also known as the Chitragani Mahal and Kamal Mahal. The highlight of the Lotus Mahal is its exceptional and distinctive architecture. It is one of the few amazing structures in Hampi that were left undamaged during the siege of the city. The term ‘Hazara Rama’ literally means a thousand Rama and refers to the multitude of relics depicting the reigning deity of the temple. The Pillars inside the temple indiciating the marvellously carved scultpures. Bala Mukunda(Krishna) in the crawling pose. The walls of the temple carry the story of Ramayana carved on stone. The outer walls of the temple are decorated with bas-relics of Rama and Krishna. The relics also portray processions of horses, elephants, attendants, soldiers and dancing women taking part in the Dasara festival rally at that time. The relics are among the most extensive ones to be found anywhere in India. The Stepped Tank is constructed using finely finished blocks of black stones. This Tank was probably used by the royals for religious purpose. The beautiful tank is about 22 square meters and about 7 meters deep. It has five distinct tiers, each fitted with steps set in a pleasing pattern. The marks on the tank and individual blocks indicate the direction of flow of water. The water to this tank was drawn through the intelligently designed stone channels which are well preserved till date. The Vittala Temple or Vitthala Temple in Hampi is an ancient monument that is well-known for its exceptional architecture and unmatched craftsmanship. It is considered to be one of the largest and the most famous structure in Hampi. The temple is located in the north eastern part of Hampi, near the banks of the Tungabhadra River. This temple is famous for the Stone made Chariot Temple having Lord Garuda inside. The Music Pillared Madapa. The Vittala Temple is regarded as the most ornate of the Vijayanagara temples. The temple comprises of several attractions that makes it a must-visit structure for tourists. In fact it is the most visited monument in Hampi and as such, it is also the most photographed monument in Hampi. The mythical association of the place with (Hampi’s version of ) Ramayana is interesting. Rama and Lakshmana were looking for a shelter during the monsoon season. Rama aimed an arrow in the Malyavanta hill direction. A cleft on the boulder atop the Malyavanta Hill is caused by the arrow, according to this story. Rama and Lakshmana stayed here till the monsoon rains are over, before marched to Lanka along with the army of Hanuman. The Mula Virat of the Temple Lord Sri Raghunatha. 13. Pampa Sarovar and Shabari Caves. Pampa Sarovar is located near the Anjaneya Hill where the hilltop Hanuman temple is located in Anegondi area. It is said that this is the sacred Lake where Shabari met Lord Rama. This hill in Hampi believed to be the birthplace of Hanuman , is located in the center of Anegondi area. You can see this hill from the Hampi side of the river as you trek along the Kampa Bhups’s Path. The deity of Hanuman is carved on the rock. Also is the small shrine for Rama and his consort Sita inside the temple. Anjanadri Hill also called the Birthplace of Lord Hanuman. This ends my two day trip to an awesome architectural and religious destination leaving in me greatest memories throughout my life. I would suggest anyone who wants to have a weekend getaway to visit this place and enjoy the experience of being in a rich cultural and religious heritage of India. Please provide your thoughts, ideas and suggestions on this first post of mine so I can do my best to rectify, follow and anything that can positively improve this effort.